The origins of the HFL actually predate the founding of the library itself. 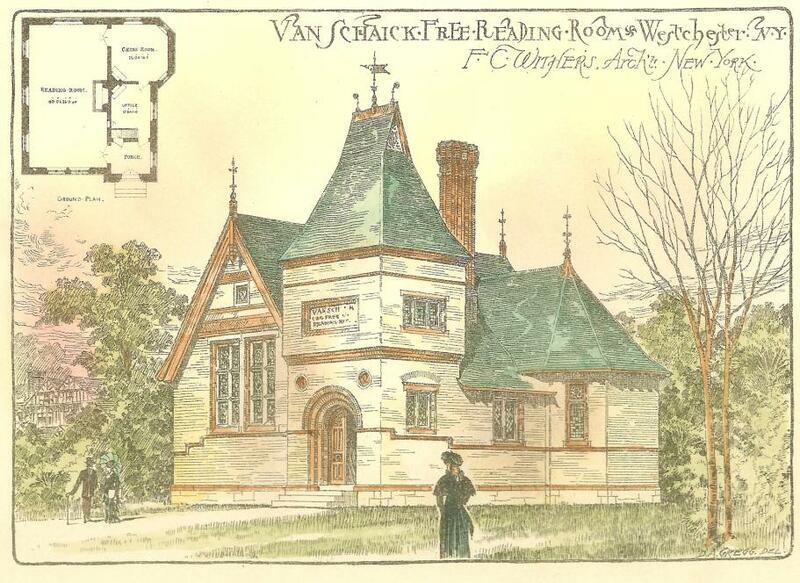 Peter C. Van Schaick, a local philanthropist, and neighbor of C.P. 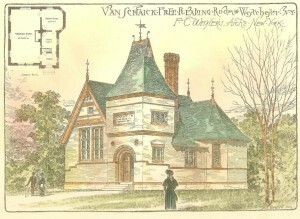 Huntington, set aside funds from his estate to build a free library and reading room to be donated to the citizens of the Village of Westchester. Frederick C. Withers, designer of Greenwich Village’s Jefferson Market Courthouse was engaged as architect and the result was a Victorian masterpiece. The library, constructed between 1882 and 1883, contained three main rooms, the main reading room, a chess room and an office. There was also a small room located within the “turret”. Sadly, this beautiful building was ultimately refused by residents of the of Westchester because they did not want to pay for its upkeep. 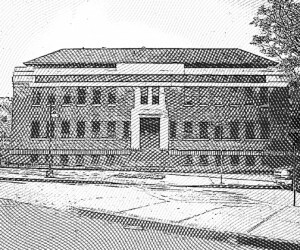 The building in Westchester sat vacant until 1890 when another local benefactor, Collis P. Huntington was somehow informed of the situation and decided to take over the project. Huntington, a Southern Pacific Railroad magnate, had a summer home nearby Throggs Neck. The Collis P. Huntington estate, known as “The Homestead” was located near the library, in Throggs Neck. His estate is still there and is now home to Preston High School. 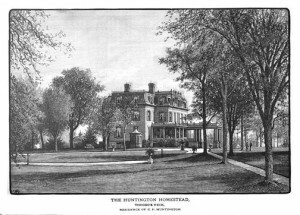 Huntington hired local architects William and James Henderson to work on the redesign of the building. 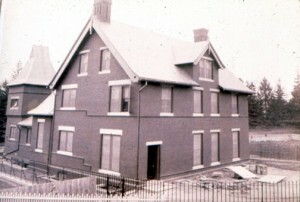 The Hendersons added a two story rear addition, as well as a billiards room on the lower level of the building. 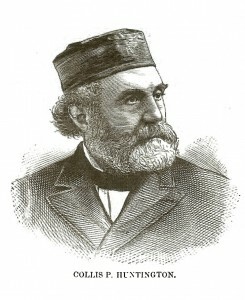 Collis P. Huntington made the opening address on October 17, 1891, and the Catholic Protectory Band supplied the music. This photo was taken shortly after the completion of the 1890 addition. The line of trees to the right line what was to become Westchester Ave and much later the elevated Pelham Bay line of the subway. In 1895, the Town of Westchester was absorbed into what would ultimately be called Greater New York. The HFL was the only library in the Westchester Square area of the Bronx for many years to come. It wasn’t until 1937 that the New York Public Library opened a branch across the street in what is now the now Owen F. Dolan parkhouse. 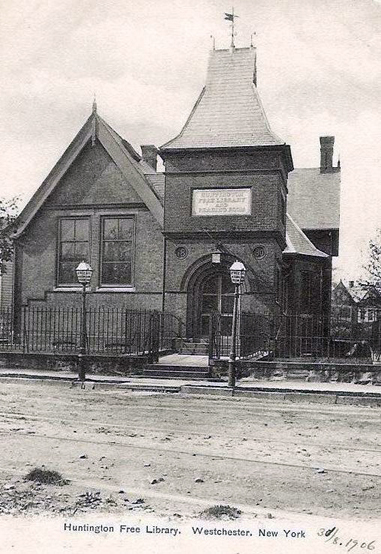 This image is actually a post card of the library, that was mailed in 1908. The library took on an important new role in 1930, when Archer M. Huntington, Collis’s adopted son and president of the HFL for over 30 years, built an addition to the Huntington Free Library to house the Museum of the American Indian, Heye Foundation’s book collection. 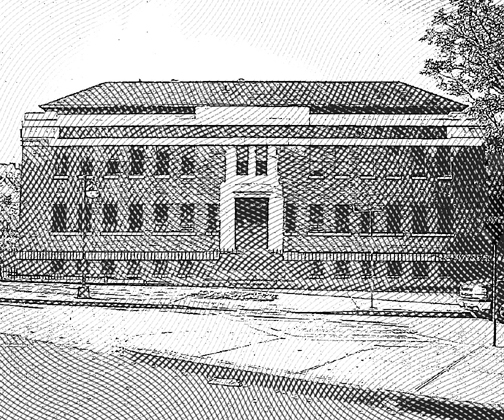 The 1930 addition designed by Charles E. Birge is a three-story, 40’ x 82’ building is attached to the original building.